Deciduous pistachio trees (Pistacia spp.) have grayish leaves and brownish-green flowers with no petals. The fruit is a drupe, or nut, that contains an edible reddish or tan seed protected by a creamy white shell. Pistachios will grow satisfactorily in some parts of Florida, but because many parts of the state do not experience cold enough winters to meet the pistachio tree's chilling requirements, fruit production may be minimal. Pistachio trees that do not get adequate winter chilling are usually short-lived. The pistachio tree is hardy in U.S. Department of Agriculture plant hardiness zones 4 through 9, and Florida's plant hardiness zones are 8 through 11. This means it's possible to grow this tree in Florida, but only in those regions that fall in USDA zone 8 or 9. The annual average minimum temperature in USDA zone 8, which includes much of northern Florida, typically ranges between 10 and 20 degrees Fahrenheit. Zone 9 includes parts of northern and central Florida, where the average minimum temperatures range between 20 and 30 degrees. In these parts of the state, you can grow pistachio trees because their chilling requirements are more likely to be met. In southern and south-central Florida, pistachio trees will not receive enough chill hours to complete dormancy. Temperate fruit crops such as the pistachio tree require a period of short days and cool to cold weather to enter a dormant state. The exposure to cool winter temperatures for a certain length of time -- the chill period -- is required for the tree to flower properly and prepare to begin active growth when temperatures grow warmer. For pistachios, chilling temperatures must be below 45 degrees. The region's total number of hours per winter below this temperature determines the chill period. Pistachio trees require long, hot, dry summers, and even prefer temperatures above 100 degrees, because heat encourages nut filling. However, pistachio trees need about a thousand accumulated chill hours at or below 45 degrees during the winter so they can break dormancy and begin normal growth in the spring. If a pistachio tree does not get enough chill hours, bud break, leaf expansion and flowering will be delayed, and fruit production will be reduced and of low quality. A healthy pistachio tree depends on more than just chilling. 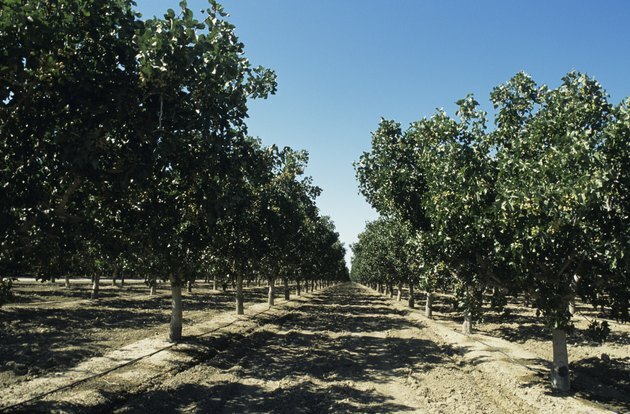 Pistachio trees will grow in almost all soils, but thrive in deep, well-drained, sandy loam soils. Pistachio trees tolerate drought, salt and alkaline soil pH, but they do not like shade or poor drainage. They are dioecious, meaning male and female flowers are produced on separate trees. One male tree is required for every eight to 10 female trees to ensure proper pollination. In an orchard, a male tree is planted in the middle of a block of female trees. Because female pistachio flowers don't have nectar petals to attract bees, pollination relies entirely on the wind. Within a month of pollination, which occurs between mid-April and mid-May, pistachio trees produce vegetative growth and the flowers form the following year. Nuts are filled after this time during July and the first part of August. What is a Good Climate for Growing Peanuts?